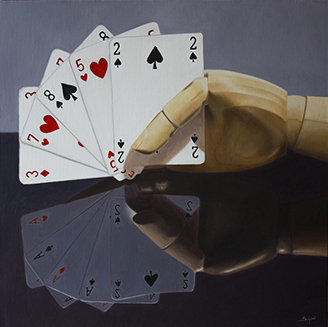 "Four Aces" is a surreal reflection of a perfect poker hand. 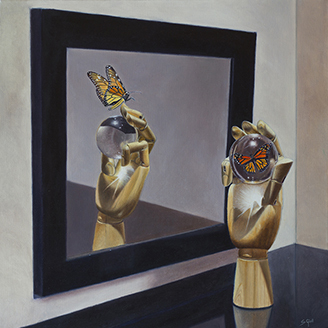 "Freedom" depicts a butterfly trapped in the crystal ball. On closer inspection, the butterfly appears released in the mirror's reflection. 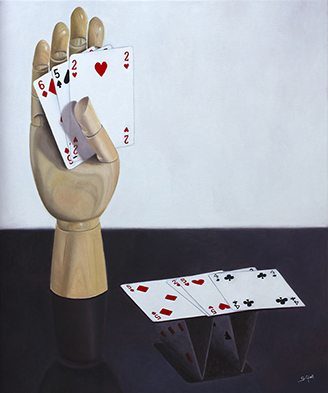 "House of cards" is a surrealistic reflection of a house of cards. 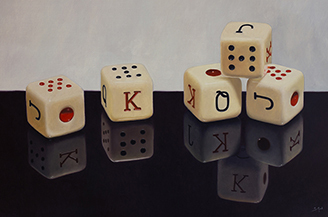 "Nothing is What it Seems" is a surreal reflection of the dice on a table. 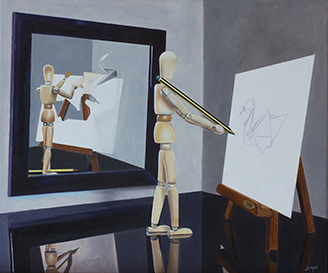 "Origami" depicts a wooden dummy drawing a swan on paper and in the reflection in the mirror, the swan is flying free from the paper. 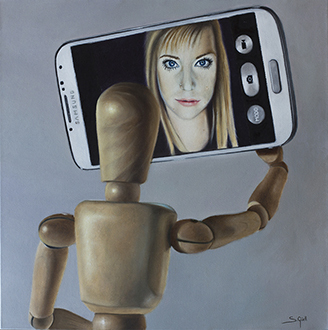 "Selfie" depicts a wooden dummy doing a surreal selfie, with a real life cell phone. 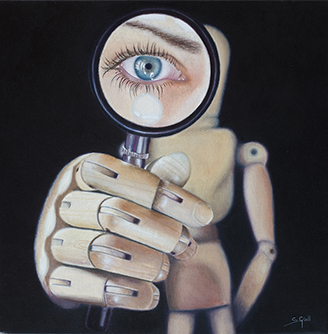 "Under magnifying glass" depicts a wooden mannequin looking through a magnifying glass. A surreal reflection. Soraya Güell is a Spanish artist, born in Girona in 1985. She began painting in 2008 when social reality led her to have some free time. She decided to start drawing, starting with family and friends, then she had the feeling that she needed to add colors in her drawings and gradually, some landscapes and interiors with still life. She is currently working on a new project whose works reflect the sketch of a glamorous and exciting world to get lost, an optimistic way of thinking about how we would like to see the world and things. Ideal scenes, but practically impossible or difficult to implement. Güell plays with uniting the continuous actual present and future through illogical reflections with a touch of surreal humor.